This post was written by my lovely husband, Ian Braisby – Blue Badge Guide. I hope everyone finds this as interesting to read as I did. The latest figures suggest that there are 6909 languages in the world, and many more have died out in the past hundred to two hundred years. That’s a lot of languages! They are what we call “living languages”, which means they have developed over time and are used by people as their primary means of communication throughout their lives. People who are born and grow up in areas where they are spoken learn them as their native language. But there are also invented languages – entire languages deliberately created by people for specific purposes. Essentially, these languages fall into two categories, namely those that have been developed for people with different native languages to communicate and those invented for use in fiction. Let’s start by looking at languages developed to aid communication. The 19th Century was when there was most interest in the concept of a global language. This was a time of almost constant conflict between great powers in Europe, with far fewer opportunities for travel and understanding foreign cultures than we enjoy today. Some people strongly believed that one way to ease international tension and emphasise the common experiences and humanity of people in different countries was to have a shared means of communication. Since choosing the existing language of one particular country would in itself cause controversy, conflict and resentment, the idea emerged of creating a new language that everyone would be able to learn in addition to their native tongue. One of the first serious attempts was Volapuk, which was proposed in 1879. Initially it proved popular, with language learning clubs springing up across the globe. But within around 15 years its significance had faded, mainly due to arguments between leading figures in the Volapuk movement about specific elements of the language and its usage. Volapuk’s position as the leading artificial language was taken over by Esperanto. Initially created by Polish doctor L.L. Zamenhof, it quickly became popular and remains the most widely spoken and understood language of its type to this day. An estimated 2 million people have some understanding of Esperanto and there are even some people (children of Esperanto-speaking parents) who claim it as a native language. Zamenhof’s intention was for the language to improve communication and understanding between nations, and to that end he devised a language that would be easy to learn, with standard vocabulary and a logical, simple grammar with few irregularities and exceptions. Despite its popularity, and even attempts to have it included as an official language of the League of Nations after World War 1, Esperanto never made the step to becoming a genuine international means of communication. Ultimately, it was unable to supersede existing national languages, with their centuries of history and psychological links to national identity. As a result, learning Esperanto became predominantly an academic exercise or an interesting hobby for language enthusiasts. The examples of Volapuk and Esperanto show that attempts to invent languages in the real world have largely been based on a desire to bring people closer together. But what of the many languages that have been created in fiction? What purpose do they serve? We can understand this best by looking at some famous examples. Probably the most famous creator of fictional languages is J.R.R. Tolkien. Indeed, since most of the well-known invented languages in fiction can be found within the fantasy and science fiction genres, it is not unrealistic to say that Tolkien set the trend for all the later writers. The key fact to remember about Tolkien is that he was primarily a linguist – his academic career was in linguistics and languages were his obsession throughout his life from an early age. So he had a profound understanding of how languages worked. Initially, the languages he created (early forms of what became known as Elvish) were purely an intellectual exercise on his part. But because he was a linguist he recognised something that the inventors of real-world languages like Volapuk and Esperanto had failed to consider – namely that languages do not exist in a vacuum and do not just appear fully formed and then remain the same. They have a context. So Tolkien began to construct a context for his languages – people to speak them, an environment that the languages describe, a history that shapes them, mythologies and stories for the languages to recount, and events that cause them to evolve. Everything that Tolkien would write, his whole imaginary world of Middle Earth and the races who inhabit it, was originally conceived as a context for his languages. The way Tolkien used languages, linking their appearance and feel to the culture and character of the people who speak them, was the model for invented languages in fiction since he was writing. For all writers, Tolkien included, their invented languages serve a crucial purpose in their storytelling, namely to add realism and background. Everyone knows that people from different places and cultures speak different languages. When a story takes place in the real world, writers are not so concerned with emphasising this – they can write a French or Chinese person’s dialogue in English as the reader instinctively knows that the character would actually be speaking their native language. People have an idea of where the characters come from and what their culture is like. Fantasy and science fiction writers have a different challenge. They are often describing invented worlds so they need to provide much more information about their characters and their origins, as well as finding ways to differentiate races and cultures. Invented languages are one of the key ways they do this, as they add crucial authenticity to the fictional world created. They also reflect the different cultural traits the writer wants to assign to these races – look at how many times in books (or films) a warlike race will have a guttural language, while people with a more intellectual or even magical culture speak in a much more lyrical way. For example, contrast the Dothraki and High Valyrian languages created by George R.R. Martin for his Song of Ice and Fire Series (and the TV adaptation Game of Thrones). Adaptation of books into films and the making of original films has brought an added dimension to the invented languages, as they have to be spoken by actors, not just written on the page. Many fantasy and sci-fi films employ specialist language creators and consultants to ensure that the finished production is as authentic as possible (and of course to coach the actors!). They often need to expand the small amounts of language created by the original author and, following Tolkien’s example, go far beyond what is actually needed on screen to end up with entire new languages with grammar, vocabulary and cultural context. For some fans of films, learning some of these languages is a way to immerse themselves even more in the fictional world. Fans of Star Trek, for example, can sign up to numerous Klingon language courses or even buy grammar books and dictionaries. Whether Lord of the Rings, A Clockwork Orange, Star Trek, Game of Thrones, Avatar or many more, invented languages play a key role in fiction, especially the fantasy and sci-fi genres. They add realism to imaginary worlds and peoples, as well as providing extra interest and fascination for readers and fans. It is certainly fair to say that the use of invented languages in fiction has been far more successful than in the real world. And the purpose they serve so effectively in fiction emphasises precisely why real world experiments have tended to fail, namely that languages are bound up with history, culture and identity. No matter how humanitarian the principle and intent, it could be argued that inventing a single language without those influences is always doomed to be unsuccessful. This festival is celebrated in Mexico on the 1st and 2nd November. It is a day when families gather together to remember their loved ones who have died. 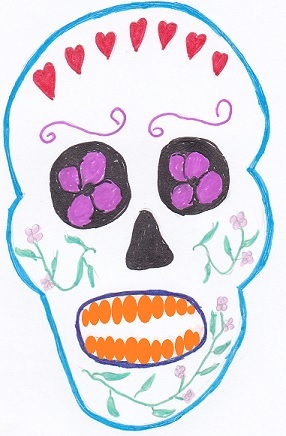 Despite being celebrated so close to Halloween, there is nothing ghoulish about the Day of the Dead (or el Día de Muertos as it’s known in Spanish), nor is it a sombre occasion. Families don’t get together to mourn their dead, but rather to celebrate their life. They make altars for their loved ones, or visit their graves and decorate the gravestones, often even having a picnic at the graveside. It is said that the spirits of the dead come back to earth for one day, first babies and children who have died and later the adults. The festival coincides with All Saints’ Day (1st November) and All Souls’ Day (2nd November), but like many dates in the Christian calendar, the festival has its roots much further back in time than the arrival of Christianity in Mexico, dating back to the Aztecs. It was a festival to honour the Goddess of Death, Mictecacihuatl, and originally lasted for the whole of the 9th month of the Aztec calendar (from around mid July to mid August). The Spanish conquistadores tried to eradicate the festival, but the Aztecs clung tightly to their beliefs. Eventually the festival was reduced to just two days and was moved to coincide with appropriate dates in the Christian calendar. However the celebrations still have a nod towards the original Aztec celebrations, and Mictecacihuatl, in the guise of a well-dressed skeleton, still plays an important role. I also found this post about Day of the Dead in Poland.